Posted by ronannarbor in Broadway Musicals, musical theater, Theatre. There are some shows that any theater in Michigan best leave to Croswell with it’s big budget and full orchestra. 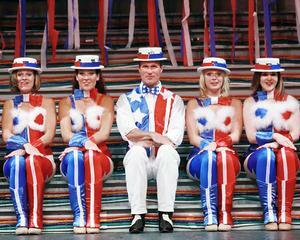 One of those shows is The Will Rogers Follies which makes its second appearance at COH in the past 15 years. And its a doozy. Kent Sheridan not only returns to star as Will Rogers (and a great performance it is), but also directs the fast-paced but long (2 hours 45 minutes) production. You won’t feel any of that time pass slowly, the show is immensely entertaining. The cast is super from top to bottom, and does a fantastic job integrating professional performances with those of amateurs. Kent knows how to highlight the strongest performers, and he and Ashley Nowak (Betty Rogers) have fine chemistry together. Lucy Hagedorn turns in a can’t-take-your-eyes-off-of-her performance as Ziegfeld’s Favorite (watch her with the horse – your eyes will tear up with laughter). William McCloskey makes a fine and ornery Clem Rogers. The ensemble is terrific — and they are beautifully outfitted by Mary Scott. This is a huge-budget show for sets and costumes, and it all shows in this fine-looking production. Scenic Designer Robert Soller has created workable sets, and the show flows from scene to scene with not a glitch that I saw. Less fortunate is the lighting which is well-designed, but which sometimes lags behind the performers. It overall looks quite good once things slow down. The wonderful multi-colored staircase works well throughout the show, and recreates the original Broadway set quite adequately. Kristi Davis recreates the original Broadway choreography quite well. A few steps have been adapted here and there for the cast, but for the most part, is identical to what people saw in NYC (and apparently all regional productions of this show — I have now seen the show in NYC, Phoenix, Adrian twice, and on tour in SF, and the choreography has been near-identical in every production). “Our Favorite Son” is a true show-stopper. Congratulations to the entire ensemble for this amazing number. It’s worth the price of admission. But so is the rest of the show. It is that good. I can’t finish the review without mentioning the poor sound. Throughout the production mics popped, creaked, moaned, and in more than one instance you could hear people talking backstage on their mics which were not turned down by the soundboard. In other instances, the balance of sound was not well-modulated from the board — younger members of the cast were overamplified while older more mature voices were not as prominent resulting in occasionally poor blend through the sound system. It’s difficult to mic a 26-member cast, but it shouldn’t be that difficult for a production of this caliber. Go see this show. Its a wonderful way to spend an evening or afternoon, and you will absolutely love Kent Sheridan as Will Rogers. He continues his long line of appearance as Will in this strong Croswell production. And bring a friend. They will love the show, and if they’ve never seen the Croswell Opera House they will surely come back for more in the future. Posted by ronannarbor in Broadway Musicals, Entertainment, musical theater. Phantom makes its final stop in Michigan (the tour is about to close after 18 years) at the Wharton Center in East Lansing, and it is everything you expect – no more, no less. Andrew Lloyd Webber forever changed the face of musical theater tours when he emphasized the production values so that audiences on the road would see the identical show as on Broadway – down to the sets and costumes. So far, the musical tour has grossed OVER 5 BILLION dollars, so it has all paid off. The third road company at the Wharton Center is first rate. Tim Martin Gleason (as the Phantom) has basically spent his professional life doing the show (starting in Ensemble then Raoul on tour and the Vegas spectacular) and now The Phantom. He is very good. Trista Moldovan (in the performance I saw) makes a fine Christine Daae – her voice is lovely. (At some performances, Kelly Jeanne Grant performs the role). But nobody really comes to see Phantom to review the performances. It’s about the sets, the costumes, the music, the lights, and that Chandelier. And it all looks magnificent (even if the chandelier looks completely out of place in ultra-modern Wharton Center if you are sitting anywhere but center orchestra). 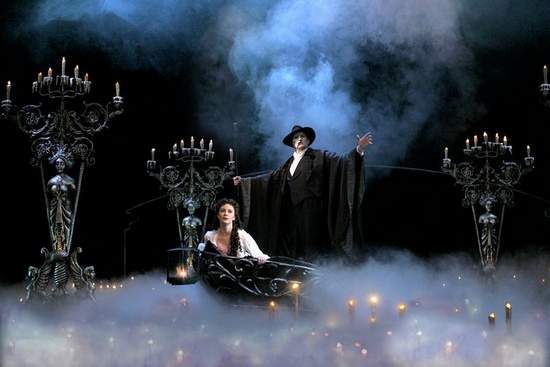 When the phantom steals Christine away and takes her to his watery underground lair for the first time, the thrill of the candlelit boatride through the fog is still one of musical theater’s most indelible images — this is pure stage magic for a few minutes, and it’s one of my all-time favorite stage moments (see photo above). The production tours with 27 trucks, and over 100 cast, crew, orchestra, and front-of-house personnel. This isn’t the first time Phantom has been an East Lansing boxoffice dynamo — but it is, sadly, the last. If you haven’t seen Phantom before — for heavens sake, get a ticket and go enjoy this musical theater standard. If you have seen it before, you can probably take or leave this production, given it is identical to the performance you saw (wherever it was that you saw it.) But for theater purists, it’s your last chance to see the show with its original sets, costumes, stage effects and whatnot before your local community theaters start massacring the show a few years from now. This is a musical you DONT want to see performed by your local amateur group. Phantom takes a lovely final bow at the Wharton Center. Highly Recommended. Posted by ronannarbor in musical theater, Theatre. 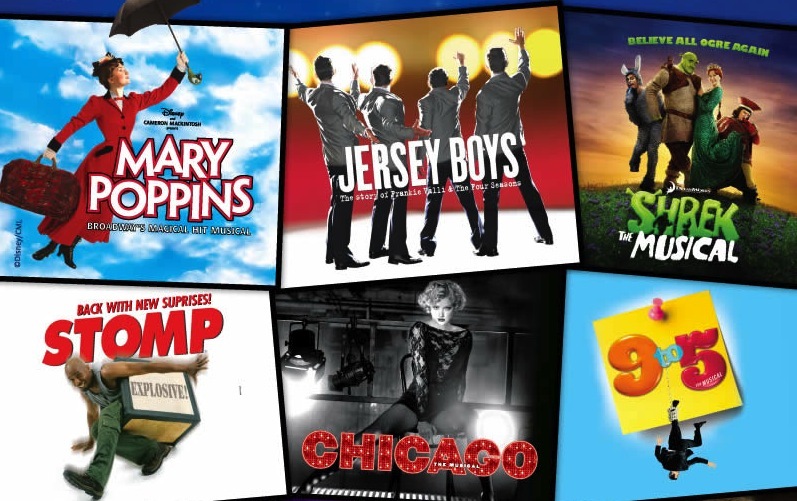 Wharton Center in East Lansing has announced their 2010-2011 Season. Jersey Boys – Sept 28 – Oct 16 (2011) – Which technically makes this the 2011-2012 season, but I guess Wharton Center is charging for them now with their subscription for 2010-11 — Go see it in Toronto where it has a sitdown production. Posted by ronannarbor in musical theater. 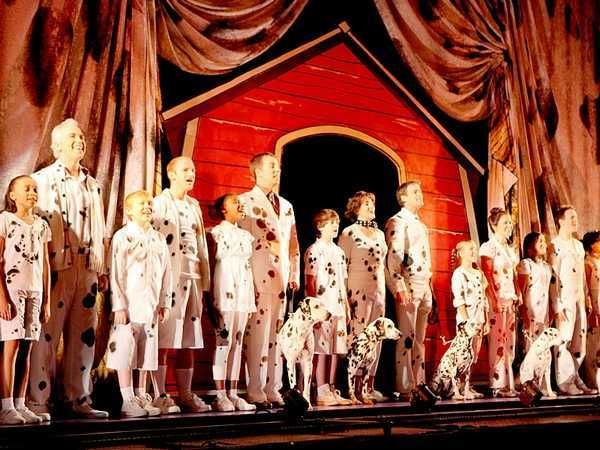 “101 Dalmations” the musical, has posted a closing notice. It will continue with its current tour, which opens in NYC at Madison Square Garden in a few weeks, and will close on 4/18. All further national tour dates have been cancelled. This is a shame — I’ve previously written a blog entry on the show. It needed work, and it was not ready for prime time. 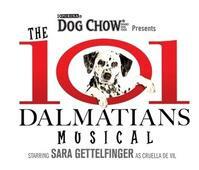 101 Dalmations has played at both the Fox Theater in Detroit and Wharton Center in East Lansing during the past few month. Rachel York, the show’s dynamite shining star, departed the cast on January 31st. Sara Gettelfinger took over the role of Cruella DeVil and will play the part in NYC. Sad to see another show with 30 cast members and a huge crew close — but the show never achieved its lofty goals, had a week score, and required massive re-do of sets, costumes, and concept (i.e. eliminating adults on stilts) if it wanted to go anywhere. It might have been beyond fixing. At either rate, the producers did not give reason for closing the show. Posted by ronannarbor in Entertainment, Theatre. Okay, let me state this for the record: I have seen White Christmas, the musical, 7 times now – between San Francisco, Boston, Detroit, and East Lansing. I love this show, and am not going to review the show itself…This is the 2009 Tour that made a one-week stop at the Wharton Center at MSU, East Lansing. The show is a dream – and the cast is one of the best I’ve seen since the initial production in San Francisco (still my favorite cast – but maybe just because I saw them first and could brag for a year until other people started to see the show in it’s season incarnations). Stephen Bogardus and Kerry O’Malley reprise their roles from the NYC 2008 production. David Elder and Megan Sikora play their dancing-fool sidekicks, and they are dandy together. This production features the best-danced “I Love a Piano” that I have seen in four different incarnations. The Elder/Sikora “Best Things Happen While You’re Dancing” is perfection. The tap dancing throughout this production is spectacular by the entire cast. Stephen Bogardus brings charm and style to his role, while Kerry O’Malley is just plain lovable. What is currently a drought of productions and jobs on Broadway has resulted in one of the most talented dancing casts in ages — there are folks in this show that normally play leads in other musicals. It all lends a wonderfully polished perfection to the show as a whole. Lorna Luft makes a fine Martha Watson and sings her heart out in her big show-stopper number. Her stardom in no way overshadows any of the cast members, and she appears to be having the time of her life. For those who saw the show at the Fox Theatre, be warned that it’s a different creature at Wharton Center — featured as part of it’s Broadway tour season, the performances are near sold-out throughout the run. There appear to be balcony and scattered rear orchestra seats available for some performances this week — but don’t expect you can walk up to the box office like you could at the Fox and just get great seats. Not the case here. For those not in the know – this is just a holiday treat — a big, colorful, Randy Skinner tap-dance filled extravaganza. 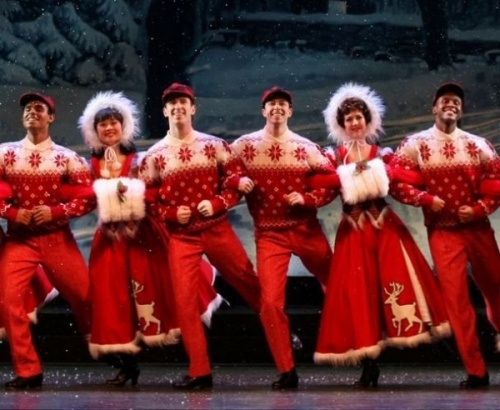 It could really play at any time, not just Christmas time — it’s a full-blown Broadway musical with spectacular dancing and a fine familiar book and score. Filled with classics like “White Christmas”, “Count Your Blessings Instead of Sheep”, “Snow”, “Blue Skies”, “Sisters”, “I’ve Got My love to Keep Me Warm” and a half-dozen others. It moves at lightning pace, and it’s a musical lovers musical, much like “42nd Street” or “Babes in Arms”. Go, have fun, and see a spectacular cast. On a final note — beware the weather. I don’t know which was more exciting on Tuesday night — opening night at White Christmas, or the spectacularly dangerous drive home to Ann Arbor for an hour in some of the worst driving weather you could imagine — snow, turning to sleet, turning to ice. I hate driving, and I particularly hated driving home after the show. Luckily I had the White Christmas cast album on my iPhone to play through the car stereo system to keep me in a good mood. Check the weather reports before you head out this week. I leave for Florida tomorrow, or I would have seen the show a second time if I could. But I’m glad I will be out of this weather in less than 24 hours for a week. For those of you left behind in this Michigan weather — go enjoy this “warm cup of hot chocolate” musical. Go see a Broadway show. And that’s the view from Ann Arbor this week. Something very rare happened at the Fox Theatre last night in Detroit. I walked to the Box Office at intermission to get a ticket to see the show a second time for later in the weekend. Little House on the Prairie, the Musical, is wholesome, lovely, and pure. It brings something to the musical theatre that hasn’t been seen in a long, long time — a STORY, told simply, with a great cast, costumes, set, and fully geared to the entire family. Granted, this is not West Side Story. The tale being told here is simple, humorous, and lively. It’s family theatre, and it’s fine. 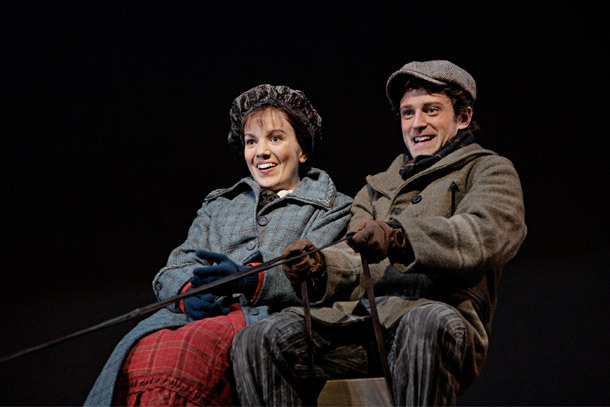 Seen only a few weeks after the not-ready-for-primetime “101 Dalmations, the musical”, Little House is a breath of fresh air – and I mean that in the best way. While the musical follows the written books, not the tv show, everything here will be familiar (at least to 30-somethings and up). But there is a wonderful story for your young ones to follow as well. The audience was rapt to the show from start to finish, and I have to admit, there are some big tears by the end of the show — I dare you not to well up. I dare you, because you SHOULD well-up — it’s directed beautifully and performed pitch-perfectly to the style and size of the show, and the emotions are perfectly manipulated for you. I’m a big fan of gratuitous emotional manipulation if it is done right — and here it is done right — it sneaks up on you and catches you with a lump in your throat for most of Act II (which is stronger, by the way, than Act I). Once again, the Fox Theatre proves to be the wrong venue for the production – and was more than half empty at the performance I saw. This is a musical that deserves to be seen. It came to town with great word of mouth from audiences, and critical word of mouth from theatre folks I know. Well, they’re Scrooges if they can’t take a family-classic and enjoy it for a couple hours. I loved it. As I stated before, I loved it so much I’m going back to see it again. If you saw the musical version of LITTLE WOMEN a few seasons ago, you’ll instantly be familiar with the style of story theatre employed here — props become other objects, set changes and technical objects are kept to a minimum, and the musical focuses on the story at play. The music is lovely — it evokes Americana at it’s best; though like Aaron Copland or Charles Ives, it soon fades away from memory. But it’s integrated well with the lyrics, and it sweeps you along on, well, the prairie. The art design is perfect for the show, and reminds you that life used to be lived on a much larger canvas than it is now. And the cast itself is one of the most appealing I’ve seen in a long time. Highly recommended — and I mean that in the most genuine, wholesome, lovely, purest way. This is clean-cut American musical theatre, and it deserves to be seen. Forget the cynics, just get your tickets. It’s here through Sunday. There is nothing objectionable for your little ones (though you might have to explain some of the storyline to them on the way home). Let me just warn you — if you think “Rent” is the best musical ever written, you are going to absolutely hate this musical — call it the anti-Rent…it’s the kind of show that was a dime a dozen in the 50’s — the musicals I grew up on, and the musicals that I consider the “heart” of musical comedy. And that’s the view from Ann Arbor today. Posted by ronannarbor in Detroit, Entertainment, Theatre. Legally Blonde, the musical, as any 13-year old girl knows, is the girl-power Broadway show that tells the tale of Elle Woods trip to Harvard Law School, initially to follow her ex-boyfriend, and ultimately to find success as a lawyer, find new love, and save the day for a former sorority sister accused of murder. I mention the 13-year old girls, because the Broadway Production was televised on MTV continuously for about three months last year, creating it’s own super-buzz and following. The tour now stops at the Fisher Theatre — and it’s good. It’s easy to dismiss this entertaining musical — but sit in the theatre for a live presentation for a few hours and you will find yourself completely delighted by the show and its infectious energy and music. Becky Gulsvig as Elle Woods in Legally Blonde, the Musical. Photo courtesy Broadway in Detroit. Seen in a matinee performance filled with screaming 13-year old girls (continuing the nauseating trend started with Wicked and it’s screaming-fan audience after every song) Becky Gulsvig appears to be having the time of her life, and the energetic and talented cast exudes charisma. The screaming was there at the Palace Theatre too, by the way, when I saw the show in NYC. It’s a loud show — and not in an appropriate way: the kids talk during the show, eat candy, tear open bags of treats, and act like they are at a movie theatre. You will most likely fare better at an evening performance when the 13-year olds (and their 9 year old sisters) are at home in bed. For those who have seen the Broadway production, there are a few minor set changes but the production is generally intact…but Jerry Mitchell’s highly energetic directing/choreography work well at the Fisher, and the show is really quite fun. There isn’t much to think about on the way out the door, but it’s an entertaining piece of musical theatre that fares much better than a lot of movies-turned-into-musicals — and look out when this show is released for amateur production — every high school, college, and community theatre will be jumping on this one: a pop-rock score with enough roles for girls, and its guaranteed amateur theatre overkill. See it now with a professional cast and production values and it’s a show you can genuinely call charming. See it next year at your daughter’s high school and not so much. Recommended, and better than you would think. “Evita”, currently running at the Lydia Mendelssohn Theatre at the University of Michigan is a musical theatre diamond. Presented by the Musical Theatre department, it is as slick as a Broadway tour, and as tight as a college production can be. The production reaffirms that the only current professional caliber musical theatre being presented in Ann Arbor is being done by the UM Musical Theatre program. Let me state up front that I love big-budget proscenium-theatre musicals with full orchestras. Especially when they are done right. Under the expert direction of Linda Goodrich, the show plays out exactly as it should — a fast, straight-forward Act I, followed by an ever-increasingly more emotional Act II, through to the tear-jerker ending. “Buenos Aires” and “A New Argentina” remain Act One’s highlights, while “Don’t Cry for Me Argentina” and “Rainbow Tour” are clearly Act Two’s forte pieces. To be sure, this is a problematic work of musical theatre. The Peron story doesn’t really play out true to reality, and follows a “spin” on her biography that bends the truth, and is mean-spirited at that. The Broadway production catapulted Patty LuPone to stardom (ironically, she will be performing here later this year). But this production is simply first rate, from the fine performances of Desi Oakley (Eva) and Carlos Valdes (Che) to the smaller ensemble parts. The costumes, sets, lighting, choreography, sound, and orchestra are professional and slick. In short, everything a production of the show should be. Linda Goodrich and her design team have made the theatre feel twice the size that it is, and the simple (but beautifully designed) tiered set makes the proscenium arch feel far higher than it is. This is just plain old great design work. The costumes here, like in the original Broadway production, instantly make an indelible impression – separating class, age, and social rank – and make scene changes seamless and fluid without set changes. Can I add that Desi gets to wear the most stunning clothing I’ve seen in a show this season? By the time Eva reaches her Rainbow Tour, you are utterly transported to a different time and place. By that point in the story, the emotion has also kicked into high gear and it’s a race to the conclusion. Brava to both Ms. Oakley as well as Linda Goodrich’s fine pacing and direction. This is a love it or hate it work of theatre. The same can’t be said of the production, and I loved it. Unfortunately, unless you already have tickets, you won’t be seeing this one. Every performance has been sold out for weeks. Posted by ronannarbor in Theatre, Uncategorized. The Boys in the Photograph, the reworking of Andrew Lloyd Webber and Ben Elton’s The Beautiful Game, opened last weekend in Toronto at the Royal Alexandra Theatre. This is a stunning work of theatre not to be missed this season. Where The Beautiful Game told the story in big-budget West End style, this is a pared-down, more intimate production. It explains the goings-on more clearly for those of us on this side of the Atlantic. Call this the “Belfast West Side Story” and you have a close approximation of what to expect — a politically/religiously charged romantic story, set amongst the dreams of soccer, with tragedy thrown in. There’s plenty of pop rock score to keep it all abuzz, and a few terrific ballads thrown in as well. There’s a well-choreoraphed Soccer game; star performances from the young leads, and something to think about on the way out the door. The very fine no-name all-Canadian cast is sure to jump-start some of the careers of these young folks, and set a few hearts aflutter (straight and gay) in the audience as well. In particular, Erica Peck wrings every note of emotion out of the ballad “If This Is What We’re Fighting For.” It’s an instant theatre classic, and hers will be the rendition people remember, the way Betty Buckley’s “Memory” has been passed down in Musical Theatre history or Jennifer Holiday’s “I’m Telling You I’m Not Going” became Dreamgirls’ iconic moment. Without giving too much away, I can tell you that the story plays out in the late 60’s and early 70’s in Belfast Northern Ireland, amidst the religious and political turmoil of the times. It speaks of love, and the things that keep us human, and the reality of dashed dreams. There are lively anthems and rock songs; and a very gritty love story. It’s about commitment to a cause, as well as those who just try to sit back and stay out of it. The show is more similar in style to Webber’s Whistle Down the Wind than it is to his mega-musicals like Phantom. Playwright (and novelist and screenwriter) Ben Elton also directs this production – and he knows exactly what he wants from each actor in each scene, and he knows how to make it all play out in a style that keeps it true to its British roots, while making it more accessible to North American audiences. You don’t need to know much about the violence in Belfast before going in, and creative use of video and newsreels explains everything you need to know in between. But a few minutes into the show, you will feel as if you are in an intimate theatre in London, not one in modern day Toronto. The Royal Alexandra Theatre itself is a jewel — now 102 years old, most of us will remember it as the longtime home of Mamma Mia! in Toronto. On a final note, some curious changes were made between this production as The Beautiful Game as I saw it in London and The Boys in The Photograph in Toronto, including some musical changes and the dropping of at least one song that had become a standard. I am looking forward to the new cast recording of this production, because of the significant differences in the score. But the final product is a stirring, emotional, and lovely work of musical theatre. And its rare that modern musicals have a heart as big as this one. Very Highly Recommended. The Boys in The Photograph continues at the Royal Alexandra Theatre until November 1st (unless it is extended, which it very well could be by the time you read this). Go to http://www.Mirvish.com to buy tickets.